Caleb Farro, going big and stacking clips. Yeah, throwing corks and different spin variations off gigantic jumps is fairly hazardous. But perhaps even more dicey is trying to capture footage of athletes hucking their meat off said jumps during the most pressure-packed moments of their lives. Enter human drones Justin Mayers and Caleb Farro, GoPro employees and skiers assigned to the gnarly task of capturing mid-air footage of athletes in motion. Both Mayers and Farro line up at the top of a run, be it Big Air or Slopestyle, and then follow the athletes while holding a camera, taking off on the massive kickers, often launching some 120-feet while trying to keep the camera perfectly still. It’s a tough gig. But getting the shot is worth it. 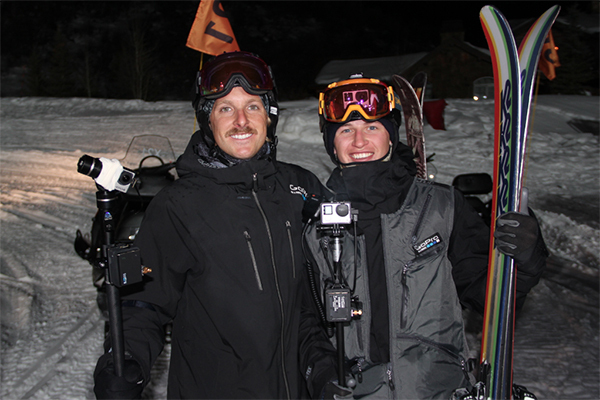 Farro, left, and Justin Mayers after the X Games Big Air event. And their team has had some carnage at this year’s X Games. Matt Cook was following Bobby Brown when he wiped out, causing his foot to swell up and forcing him to spend the rest of the Games in the editing bay–hazards of the gig when you’re going huge but your attention is focused on getting the shot instead of sticking a landing.